Howard Lindzon has, amongst many other achievements, co-founded StockTwits. He’s one of my heroes. Somewhere around March 2013 he tweeted ‘I Like Tesla’. Now, as you might have read, my road to financial freedom has been a tough cookie. But I really lived the experience, highly aware, now looking back at one hell of a trip. The lessons I took from that weren’t sugar coated and I took them right between the eyes. By 2013 they had materialized up to a point where I was able to make decent money in the stock market rather consistently. Let me tell you, in short, what happened the rest of that year. Remember, we were end March. Now, when confronted with a large sideways going chart, it gets interesting when the stock breaks out to the upside. That was at the time (or even the day) of Howard’s tweet. I bought a position with a risk small enough not to hurt me, as most of my trades are losers remember. I call it a toe in the water. A first position to see what happens. Nowadays my portfolio is large enough to limit risk on such a probe position to 0.25% of my portfolio without getting drowned in costs. Back then I went as high as 1% or even 1.5% risk. On ChartMill.com we’ve implemented a pretty cool calculator to calculate position size in function of risk, while a bunch of don’ts are being watched for you. There I was. Holding a position in Tesla. A stop beneath it firmly in place to say goodbye to it in the case it would turn south. At the time I didn’t even knew what the company was all about. To me it started out as a four letter ticker, just as many others. But the breakout was all the analysis I needed to convince me. I want to stress once more that nothing reassured me that the share price of this particular stock was going to increase. All I did was put a toe in the water because I saw a little fish jump. If I learned something in the stock market that resonates through everything in life it’s to cut your losses and add to your winners. And that was I did. Adding to my position every time it broke to new highs. If anything makes a big winner it’s having a large position. And by September I had 180% of my equity holdings in Tesla. Wait a minute you say: this is crazy! And besides, how can anyone invest more than the 100% he has available? To address the question first, it is perfectly possible, and easy, to get margin (think a loan) from a broker. But I do it with options, which I’m going to explain in the next section. As for the ‘crazy’ remark: I didn’t risk 180% of my holdings, I didn’t even invest that much. Let me just kill the two birds with the same stone. Let’s say you want to buy Tesla shares, for whatever the reason, at $40 and in the process only want to risk 0.25% of your $10000 cash. That’s $25, a real small toe in the water you could say. I’m using hypothetical and rounded numbers here, just for the sake of simplicity. Let’s further assume that at $39.5 you decide the bet’s off and you will take the loss. We’ll later look at reasons why that might be the case at that particular price. Risking $25 in total while risking $0.5 per share, means you can buy 50 shares. An investment of $2000 or 20% of what you have. 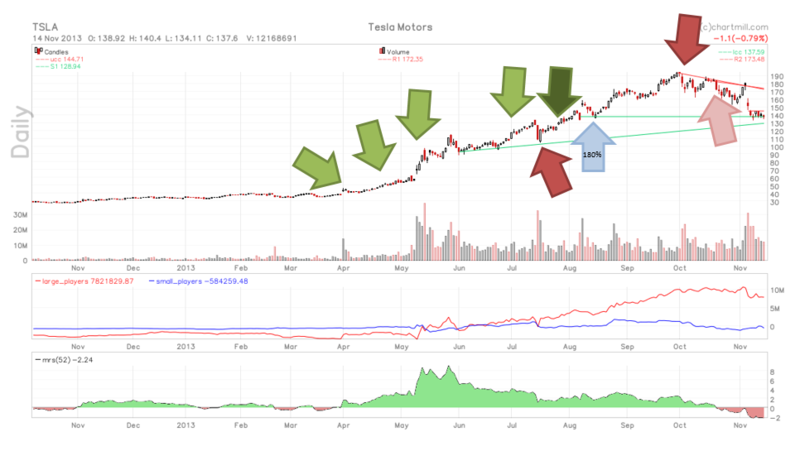 As Tesla moves higher to, let’s say, $44, you decide you can raise your protective stop to $41. This means you have $4 x 50 shares or $200 of profit. That’s a handsome 10% on your investment in the stock. Of course only $1 per share of it is safe, while $3 are still exposed. You now have a position worth $2200, a portfolio worth $10200 and an overall return of 2% with a risk of $150 or 1.47%. Being now 100% invested, we still just have 1% or $110 on the line. Deducting that from a $1000 profit, renders us a beautiful $890 or 8.9% locked in overall profit. Depending on your background and avidness with numbers, it might take you a while (or not) to get your head around these numbers. But I can promise you that if you take the effort, you will truly see how investment and profit can increase at a much higher rate than risk has to do. In the chart above, the light green arrows show my actual most important buy orders getting filled on Tesla. Two remarks come out on top when I try to explain the above. First of all, as an analyst once threw at me when I walked off the stage: Tesla is hopelessly overbought. My answer at that time was clear and simple: I know. Secondly, stops aren’t guarantees. Well, if you want a guarantee, you should probably just go out and buy a toaster. But there’s actually a better answer laying ahead. It’s true that stops aren’t fail safe. No stop is going to protect you if Tesla plunges 20% at market open on bad news arriving before the open. Either your stop has a limit, in which case it just won’t get filled, or it hasn’t and you will be killed by slippage. And there’s always the danger of losing the position when the stop is hit by market noise or a few cumulating days of downside. But that doesn’t matter. Who ever said you can’t buy back the whole position when it turns again for the better. In fact it happened to me in my TSLA trade. The whole position got away when my stop was hit at the red arrow to the left. I just bought back the whole position at once when prices entered new northern territory (dark green arrow). So keep stalking stocks that have been good to you and try to get back in at higher prices (at least higher than the highest price you paid when building up the position). It saves you time by not having to look for ‘better’ candidates, and even if you do find them, having to start over building up a position. To learn to cut my losses (and not getting back in a stopped out winner too soon – i.e. before it went higher) I simply started writing the ticker in my agenda several weeks into the future. When that day arrived, I went back to look at the stock and was very pleased to see much lower prices in many cases. Seeing higher prices didn’t seem to upset me as much as seeing lower prices made me feel good about having avoided the, at times substantial, losses. There’s a simple way to deal with the shortcomings of stops while taking care of the questionable leveraged undiversified all-in ring to all this (that surely some of you will have by now). Meet the call option. It embodies the right to buy a share at a certain price until a certain future date (depending on the type of option it might be only exactly at that date). Let’s take an example. A December call on TSLA with strike $150 could cost you $5 per share (I’m again using fictional rounded prices here for the sake of simplicity). That means that anywhere between now and December (typically the Saturday following the third Friday of that month) you can buy shares TSLA at $150. You have to pay a premium of $5 for that privilege. Now if TSLA is selling at $200 the option is worth $50 (net $45) because you have the right to buy at $150 while being able to sell at $200. This is called the option being ‘in the money’, or ITM for short. If TSLA is on display for $100, likewise OTM or ‘out of the money’, there’s no use in exercising your right, because you can buy shares cheaper on the market. Suppose, as in the above example, you have built up your position in TSLA up to an all-in of $10000, worth $15000 (a $5000 profit). Stops aren’t fail safe. But we can sell the position, extracting $15000 cash, including the $5000 or 50% of profit, from it. At the same time we could buy call options for the same number of shares at a strike slightly above the current price (which would be cheaper then slightly below it) running for the next 6 months, paying $5 a share for a total of, let’s say, $1100. This means that you safely extracted $15000, payed $1100 and are left with a $13900 or 39% profit, while still owning the rights on every share. Suppose TSLA continued to increase afterwards. No problem since you hold the right (but no obligation) to buy them back slightly above today’s prices. If TSLA plunges, your loss is limited to the $1100 you paid for the, in that case worthless, call options. If prices keep increasing beyond your expectations; you can sell the calls and buy cheaper ones at a higher prices, extracting more of your profit. You can even buy more calls then you had shares, giving up a bit more of the profit you cash in, leveraging your future position just in case the good times keep rolling for Tessie. Put many toes in the water. When you hook a position, start building it up. Never, ever, buy at a lower price than any earlier price at which you bought. If a position gets too big, start extracting the money from it and cover the same position (or more) with call options. Move your stop as the position goes in your favor. It’s useless to decide what timeframe suits you. Let the stop and the stock decide when it’s time to depart from a position. However, when kicked out by a triggered stop, keep stalking the stock. It has been good to you and might continue doing so in the future. Reenter the total position when an new breakout happens. My world slightly turned upside down when Howard became a personal acquaintance of mine since we started streaming stock twits. Dreams can come true a little bit I guess , even for an underdog. Thank you, Howard! It’s not about being right, but doing the right things when you are. Success isn’t in picking the stock but in how it is played once you own it. When to buy more and when to sell is far more important than knowing what to buy. One good trade can be a life changer.